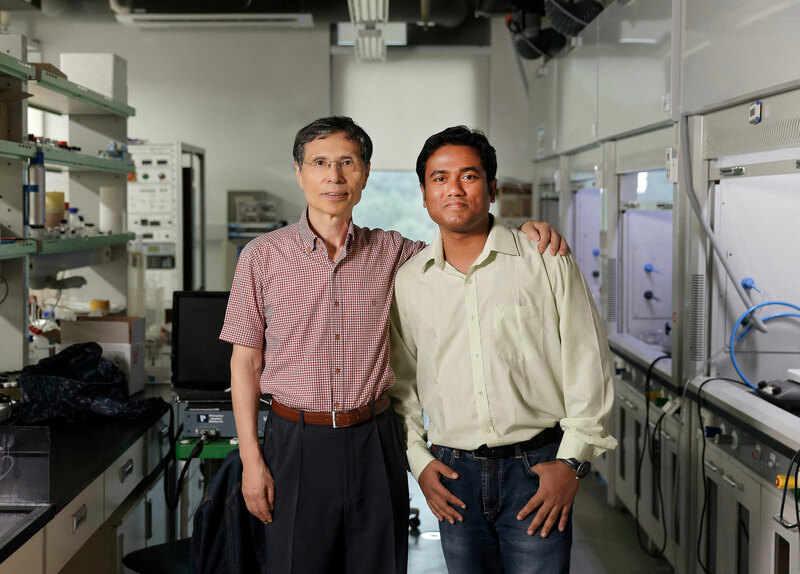 From left are Distinguished Professor Kwang S. Kim and Dr. Atanu Jana in the School of Energy and Chemical Engineering at UNIST. Their findings have been published in ACS Energy Letters on August 13, 2018. All-inorganic perovskites, known as CsPbX3 (X = Cl/Br/I) was first discovered by Wells in 1893 and hybrid perovskites or CH3NH3PbX3 were discovered in 1978 by Weber. 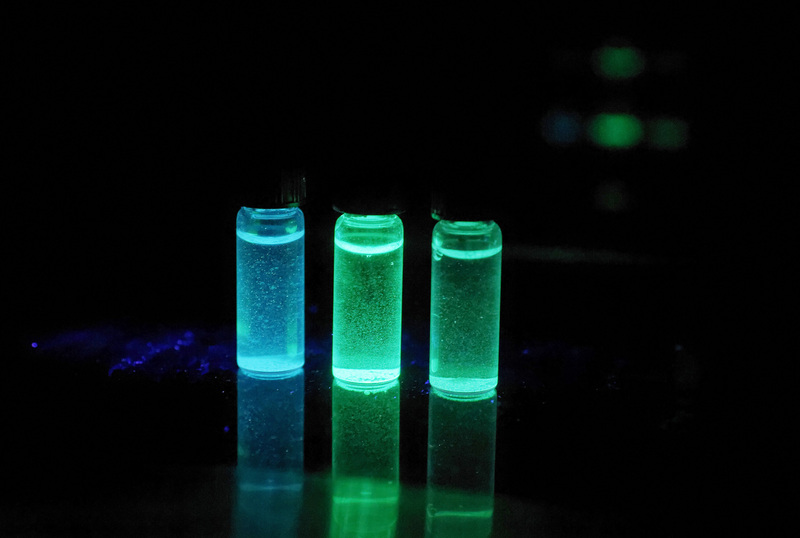 Although these materials have been the essence of the materials research community, especially in solar cells, solid-state light-emitting diodes, and many more optoelectronic devices, their practical application has been hindered due to their instability in aqueous environment. To stabilize these perovskites, several metal oxides such as SiO2, Al2O3, and Ta2O5 have been used to coat these materials. But these methods fails to give long term stability. For commercialization of any devices, it should be noted that the devices should be stable upto few years. At present, there are no methods that can stabilize the perovskite for more than one year in neutral water. A recent study, affiliated with UNIST has presented an easy, facile, and cost-effective synthetic method, capable of stabilizing perovskites without addition of foreign coating materials in aqueous media. The research team envisions that their new synthetic approach will open up a new research area for perovskite materials. This breakthrough has been led by Distinguished Professor Kwang Soo Kim in the School of Energy and Chemical Engineering at UNIST. The research team envisions that their new synthetic approach will open up a new research area for perovskite materials. Schemic image showing the Lewis base vapor diffusion (LBVD) Method. The small inner vial contains a halide acid−metal halide precursor salt, while the big outer vial contains methylamine (MAm) solution. MAm vaporizes and goes into the small vial. 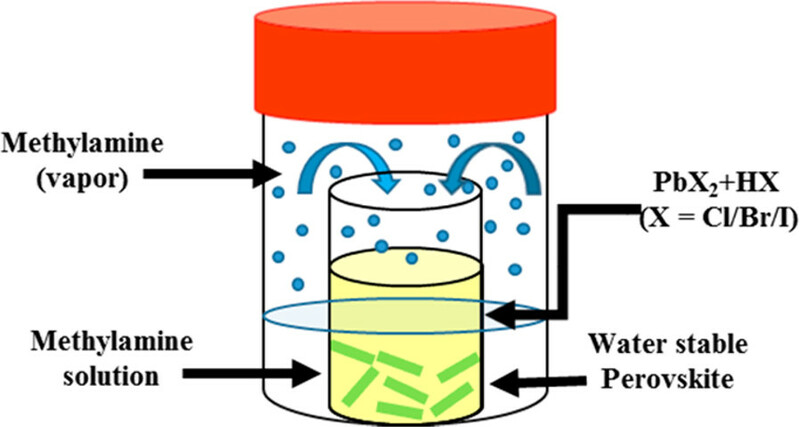 Blue balls indicate the MAm vapor, and the green rod indicates the water-stable perovskite. The magical performance of APbX3 (A = organic ammonium or inorganic cation, X = halide anion) perovskite lies in its special kind of structure where the lead cations and ammonium cations are in a 6-fold and 12-fold cuboctahedral coordination, respectively and thus perovskites materials consist of infinite number of octahedral layers connected by the corners of octahedrons. 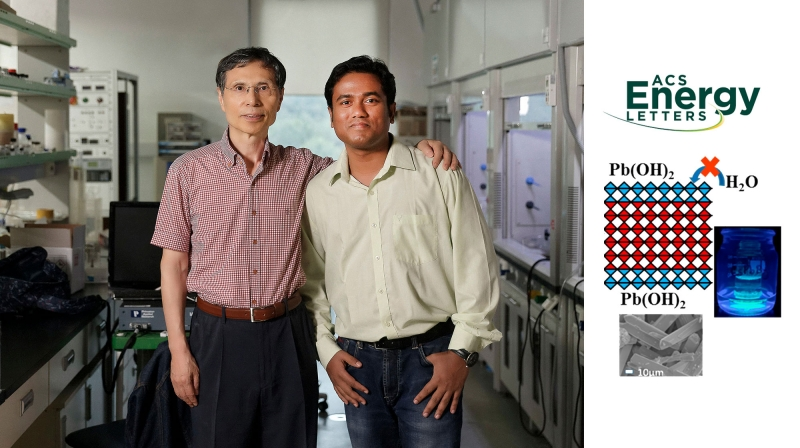 In the study, Distinguished Professor Kim and Dr. Jana developed a new synthetic method of converting few outer octahedral layers to Pb(OH)2 to protect the remaining inside layers from water. Thanks to Pb(OH)2 which is insoluble in water. By controlling the peripheral layer of octahedral perovskite geometry, the research team reproducibly synthesized a series of rodshaped fluorescent hybrid perovskites in both acidic and basic media at ambient conditions in large scale without capping ligands. The band gap is tunable from the red to sky-blue region with sharp emission. 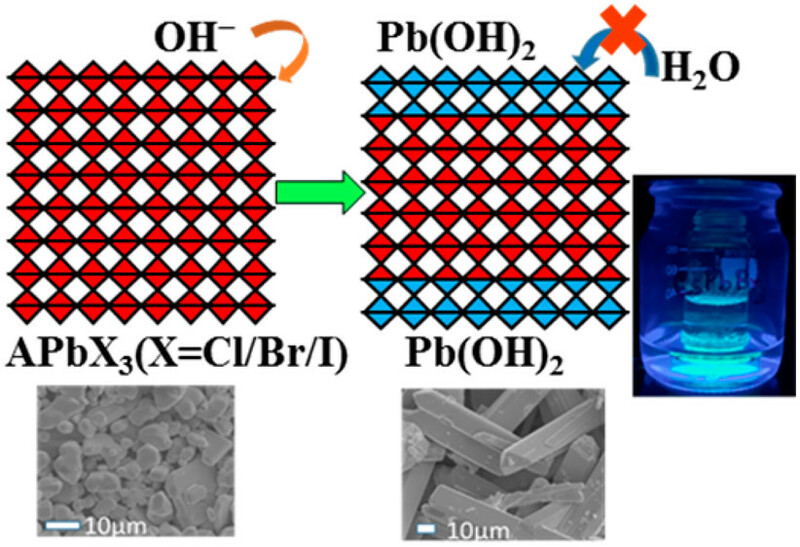 The lead bromide perovskites are stable more than 6 months in water without structural change. 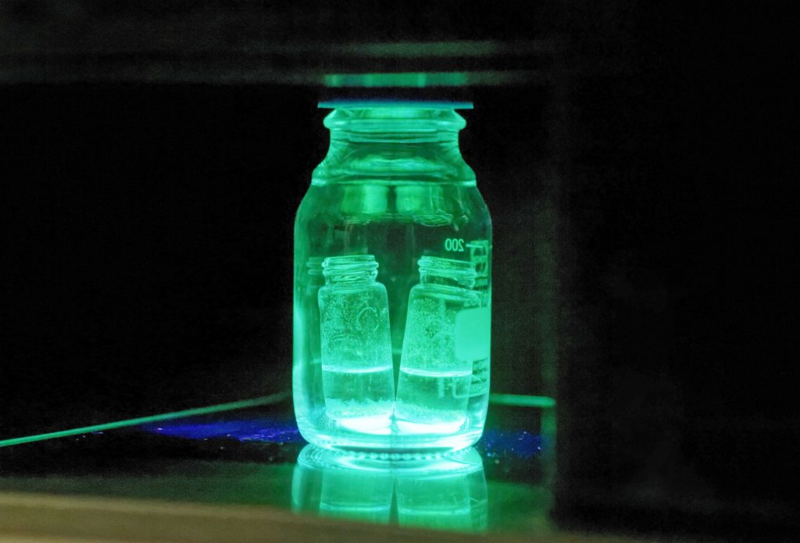 The above is water-stable perovskite sample under synthetic condition, which exhibits cyan green color in basic media during synthesis under UV light. The findings of this research have been published in ACS Energy Letters on August 13, 2018. Besides, their paper has been listed among the most read articles for the month of August in ACS Energy Letters. Atanu Jana and Kwang S. Kim, “Water-Stable, Fluorescent Organic−Inorganic Hybrid and Fully Inorganic Perovskites,” ACS Energy Lett., (2018).